You want your college dorm room to feel complete and be a cool place to hang out with your friends. Your college dorm room may not feel too complete without a dorm rug, though. Your college dorm room doesn't start out with having soft dorm carpeting. Instead, your dorm floor will be a cold linoleum that you will want to cover up. 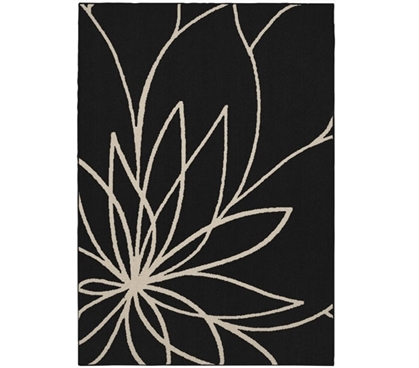 Complete your dorm room decor with our Grand Floral Dorm Rug in Black and Ivory. Our Grand Floral Dorm Rug in Black and Ivory will make your dorm room feel complete. You don't want to unpack your college supplies and feel like something is missing, and with our Grand Floral Dorm Rug in Black and Ivory, you won't. Our Grand Floral Dorm Rug in Black and Ivory features a sketched ivory flower on a black backdrop for a stunning, high impact design. The combination of neutral colors in this dorm room decoration will allow you to easily mix and match your other dorm decorations with this pretty dorm rug to complete your dorm room decor.